New Year’s Eve is Monday night! And just like the ball drops in New York City to ring out (or wring out, depending on your perspective) 2018 and usher in 2019, so will Wisconsin. We just drop other things, since we’re a quirky state to begin with. Door County’s only major fireworks show on New Year’s Eve gets complemented this year with a new tradition, now going for its 2nd year: the Door County Cherry Drop. Yes, a huge, lit cherry will be lowered as midnight approaches this New Year’s Eve on the main drag in Sister Bay. The party includes fireworks at Sister Bay Marina, live music and libations at both Husby’s & Sister Bay Bowl, and then one of our favorite Wisconsin radio stations, fm106.9 The Lodge, will broadcast live with the biggest party tunes of all time starting at 10:30pm. Then the giant sparkling cherry will drop in Sister Bay and welcome in 2019. You should too! The party continues for a while because, as you know, you have to keep it going for a while once a new year begins. Check this out right along Highway 42 in Sister Bay, where Highway 57 ends. Find out more details below on the State Trunk Tour Podcast! The Plymouth Arts Center, touting Plymouth as the “Cheese Capital of the World,” is doing the annual Big Cheese Drop and New Year’s Eve party again this year, dropping (not cutting) the Cheese at 10pm instead of midnight to make it a family event! The party still continues to and after midnight for everyone. Live Blues & Bluegrass music, champagne toast at midnight, free cheese appetizers from Sartori Cheese – it’s always a fun time. 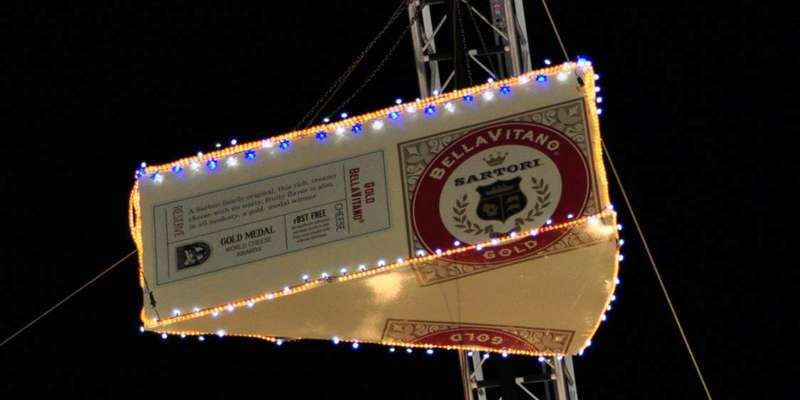 Take Highways 23, 57, or 67 to get to Plymouth for the Big Cheese Drop and ring in 2019 the cheesiest way possible! 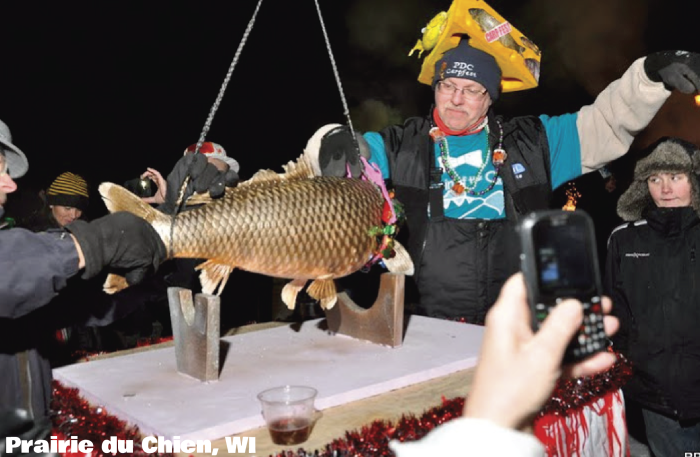 Now a Wisconsin tradition, Prairie du Chien has been fishing a carp out of the Mississippi River, freezing him, naming him “Lucky” and adorning him with makeup and lights, and then lowering him from a crane as midnight to the New Year chimes in. This year, they’re lowering the carp a little earlier. But how’s that for a New Years’ Eve fish story? It’s free, and the party starts at 8pm downtown and on St. Feriole Island in Prairie du Chien. Hit U.S. 18 or Highways 27, 35, or 60 and check this out! They have some other events related leading up to it for a larger event, now called Carp Fest. Check out all kinds of fun highways, road trips pathways, events, attractions, points of interest and more across Wisconsin for 2019 on StateTrunkTour.com. We’re adding new stuff all the time! Have a safe New Year’s Eve and a wonderful 2019!